Who wants to sleep for charity? We got close enough. Have you ever wanted to roll out of bed and walk out the door without having to do anything? Not even have to get out of your pyjamas? Well we made that happen. The charity team organised a onesie day to raise money for charity. The charity in question was The Hospice of The Good Shepherd; this is an organisation that provides palliative care to residents in Cheshire West, Chester and Deeside. This is there to help those and the families of people suffering with life-limiting illnesses. We chose this charity due to the extensive help and support they give to those in need of it; later on in life we may require help like this and with any form of charitable contribution this means it is still there. 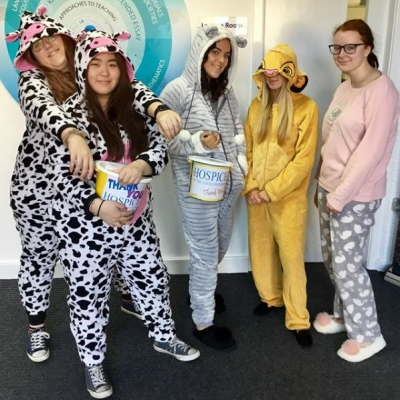 We thought 'what better way to raise money than a pyjama day?'. A day of comfort and relaxation in complete opposition to our normal business attire. Throughout this, and beforehand, we got in touch with the hospice who kindly donated buckets for collecting donations, and t-shirts for us to wear throughout our fundraising. This allowed our event to be taken seriously and have the background which may of hit home to some students. We just wanted a fun idea that everyone could partake in. Altogether we collected more than £50 which even though it doesn’t seem a huge amount it will make a huge difference to aspects of the hospice. We are planning more days like this and more events as a school in which we can raise money for the hospice and many other possible charities, this helps us give back to the community and contribute to elements of our future and the care of others.